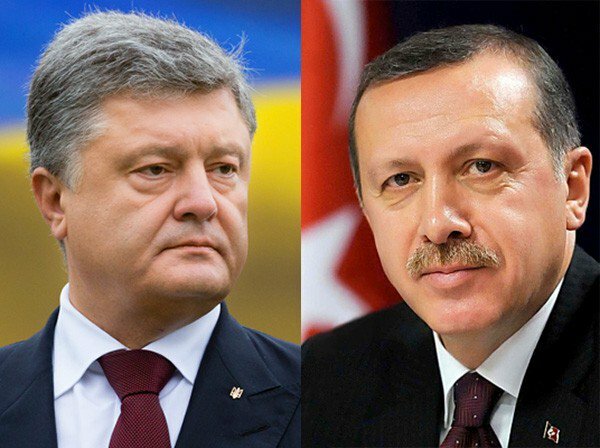 President of Ukraine Petro Poroshenko held a telephone conversation with Turkish President Recep Tayyip Erdogan. This was reported by the press service of the Presidential Administration of Ukraine. “The parties stressed the importance of accelerating the negotiation process for concluding a free trade agreement between Ukraine and Turkey,” the statement said. The interlocutors also talked about the ways to expand mutually beneficial cooperation in energy, aviation and defense. “Ukraine’s President thanked President of Turkey for his unaltered position on supporting the territorial integrity of Ukraine and protecting the rights of the Crimean Tatars,” the message reads. As it was reported earlier, the Ukrainian government intends to sign a free trade agreement with the government of Turkey, following a similar deal with the European Union, Canada, and Israel. The announcement was made by the Prime Minister of Ukraine Volodymyr Groysman on April 16. Earlier, on 28 March, Volodymyr Groysman announced that his government and its Israeli counterpart had reached the final stage of negotiations on signing the agreement on the creation of a free trade area between the two countries. According to the Prime Minister, the agreement could benefit Ukraine to the tune of $800 million.